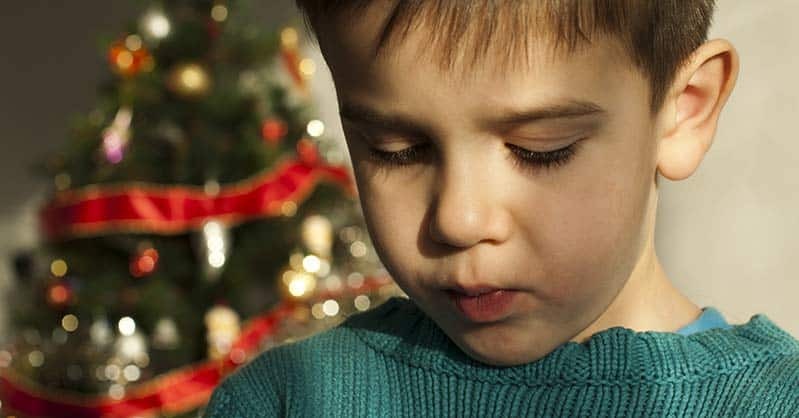 Grief during the holidays serves up a perfect storm where joyous memories crash against reality and expectations, something that is especially tough when it’s a child who’s grieving. I know this firsthand. On October 18, 1977, my uncle Doug died by suicide. I was 7 years old. While I don’t remember the specifics of the Thanksgiving and Christmas that followed, what I do remember is that everyone tried to act normal when our situation was anything but. Even though her son had just died a month earlier, my grandmother cooked the full meal, invited the whole extended family, and tried to carry on. Of course, that was her choice, and maybe doing something “normal” brought some comfort to her. I now know that her lifelong coping strategy for my uncle’s death was denial, and my sense is that staying busy was her way of avoiding a deep pain. I wish it could have been different for her, for all of us, but it wasn’t. My main memory of that holiday season was feeling confused and sad– mainly because no one was really talking about Doug. I wanted to talk about my uncle, and it felt strange that he was hardly mentioned. My mother and I discussed him in private, but as a family, there was no acknowledgment of the person that was no longer there. I find it interesting that we recognize National Childr en’s Grief Awareness Day just a week before Thanksgiving. That is exactly when I could have benefited from it when I was a kid! So I thought, in honor of this special cause, and for the grieving child I have inside and the heartbroken families that are trying to get through a difficult time of year, it’s a good time to reflect on ways we can help our children deal with their grief during the holidays. Understand the developmental perspectives of death for children. Research performed by Maria Nagy segments children’s perspectives of death into three categories, though the age ranges are a guideline and will vary from child to child. Use this information in tandem with what your child tells you about how they view the loss to find age and worldview-appropriate ways for your child to express what they feel. – Ages 3 to 5: Death is a physical relocation, and the deceased exists somewhere else. – Ages 5 to 9: Death is often personified, and can be avoided. – Ages 9 to 10: Death is universal, inevitable, and irreversible.